You should never judge an RPG by its cover, for that way madness lies. Fail your SAN roll and you can end up spending your hard-earned pocket money on something completely rubbish. I’m still falling into the trap of impulsive purchase due to great cover art (combined with eBay and red wine). 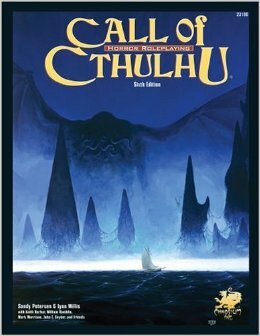 Over the past week, I’ve been sharing tweets of some of the best covers for Call of Cthulhu supplements. Naturally, I have a fondness for the early Choasium covers that managed to be both evocative of the scenarios that they contained, but also inspiring in their own right. One of the difficulties for early players of CoC was getting our heads around the concept (which was markedly different from other RPGs) and the Lovecraft mythos. The wibbly, scrunchy and indescribable alien monsters that feature in the game are, by their nature … indescribable. The early covers helped to illuminate embryonic Keepers and players on what the monsters looked like as they slowly went insane. There is something about the intensity of this image that is utterly mesmerising. It also features Nyarlathotep in my personal favourite of his many forms: Python-faced Hulk. The first supplement that I got and I chose it purely on the basis of the cover. I struggled to understand how to run CoC when I first bought the game. I assumed that it was fantasy-horror meets tommy guns and brown derbys; this supplement introduced the idea that the game was about encountering alien strangeness in the distant corners of Earth. Dubbed “The Poor Man’s Masks …” by Eddy in our group. He originally was the Keeper for the campaign back in the 1980s and I’m very excited at the prospect of returning to it in the coming months. This cover captures the unique sense of adventure and creepiness intrinsic to CoC and has been shamefully redone with a rubbish cover in later editions. The haunted house. The graveyard. The glow of a lantern. The b-movie sensibility. The subtle curl of a tentacle. I’m sold. This later edition captures the essence that Shadows of Yog-Sothoth does so well … alien strangeness. The blue glow and the foreboding presence towering over a ship gives the sense of the insignificance of the human race. A decent supplement let down by a lurid cover. The fall-out over shadowed by people falling out with axes. It fails to capitalise on an enticing proposition … genuine Mad Men!